���� To Sir, with Love, with its catchy #1 hit song and an excellent performance by Sidney Poitier, breaks no new ground but fifty years after its release it remains an excellent, entertaining and life-affirming film. To Sir, with Love II, a TV movie made 30 years after the original, does not have much of a profile but is far better than I had expected. ���� Fans of the first film, or of Poitier, should enjoy picking up this To Sir, with Love: Complete Collection from ViaVision. ���� The video and audio are fine. A trailer for the first film is the only extra. ���� Mark Thackeray (Sidney Poitier) is an engineer who cannot get a job so accepts a position as a teacher at a school in the East End of London. There he is given the worst class; a sullen and rebellious group of working class teens who in a few months will be leaving school and so do everything in their power to break Mark�s spirit. Initially Mark struggles, not only because of the hostile class leaders Denham (Christian Roberts) and Potter (Chris Chittell), but also because of the disillusioned and cynical fellow teacher Theo Weston (Geoffrey Bayldon), who delights in making comments about the colour of Mark�s skin, although Mark does gain support from Gillian (Suzy Kendall), another novice teacher at the school. When Mark despairs of ever getting through to his class, he decides on a new tactic; he dumps the books and decides instead to teach his students about life so that they are fit to leave school and enter the world. He gradually gains the respect of the class as they move towards graduation although there are complications, not the least being that one of the students, Pamela (Judy Geeson), starts to fall in love with him. ���� To Sir, with Love is based on the semi-autobiographical novel by E. R. Braithwaite while the screenwriter / director was James Clavell. He is perhaps better known as a writer with novels such as Shogun and King Rat on his resume although he does have other screenplay credits, including The Great Escape (1963). As a director Clavell has only a handful of features; his direction of To Sir, with Love is functional. ���� The film is, however, well served by the cast. Sidney Poitier had already won a best actor Oscar for Lilies of the Field (1963), the only African American to win that award until Denzel Washington almost 4 decades later, and he would go on in the next few years after To Sir, with Love to star in socially important films such as In the Heat of the Night and Guess Who�s Coming to Dinner?. His Mark Thackeray is a man of will, understanding and integrity, and Poitier effortlessly carries the picture. The other cast members Christian Roberts, Chris Chittell, Suzy Kendall and Judy Geeson are acceptable, while British pop star Lulu in her first screen role is pretty good, as well as singing that catchy #1 hit song. ���� The story of an inspirational teacher who turns around (more or less) a class of misfits or delinquents has been done to death over the years, including the Oscar nominated Blackboard Jungle (1955) in which, incidentally, Sidney Poitier had a part, and To Sir, with Love breaks no new ground. One might also be a bit cynical about the message of the film, the conduct of the class members which is lost and rebellious rather than delinquent and the supposition that a teacher can dump the curriculum without problems to teach the students about life and how to make a salad, for example. But once you get past the hair, the music and the clothes that can only be the 1960s, To Sir, with Love is a well-intentioned, well made, entertaining, life affirming story whose climax can still bring a tear to your eye. ���� To Sir, with Love is presented in the 1.85:1 aspect ratio, in 1080p, using the MPEG-4 AVC code. ���� This is a nice looking print. There is softness and obvious grain in the few exterior wide shots but interiors and close-ups are strong. Colours are natural, blacks and shadow detail good, brightness and contrast consistent and skin tones fine. There are no obvious marks or artefacts. ���� English subtitles for the hearing impaired are available in a clear white font. ���� Audio is English DTS-HD MA 2.0. The film was released theatrically with a mono audio. ���� There is a little music and crowd noise, such as during class breaks, in the rears. Dialogue is clear throughout, effects, such as the slamming of desktop, sharp enough. The original score by Ron Grainer is low key. There is in addition that hit song performed by Lulu and some additional music by The Mindbenders (probably a band best remembered for Groovy Kind of Love). ���� I did not notice any hiss or distortion. ���� Lip synchronisation was good, and even acceptable during the musical lip-synced numbers. � To Sir, with Love is available in Region Free Blu-rays in both the US and the UK; both have two audio commentaries and a range of other extras. 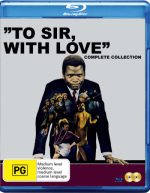 However, if you are only interested in the film and / or To Sir, with Love 2 Amazon.com lists only this Australian release of the To Sir, with Love: Complete Collection. ���� To Sir, with Love, with that catchy #1 hit song and an excellent performance by Sidney Poitier, breaks no new ground in the genre of a novice teacher dealing with a class of tough and rebellious teens, but fifty years after its release it remains an excellent, entertaining and life-affirming film. ���� The film looks fine on Blu-ray, the audio is good. A trailer is the only extra and we miss out on the extras available in other regions. ���� To Sir, with Love was released here on DVD many years ago. For fans of the film the DVD was reviewed on this site here. The Blu-ray has a good HD presentation, lossless audio, and the same trailer as an extra which, for fans, would be enough to warrant an upgrade. This Blu-ray also forms part of the To Sir, with Love: Complete Collection which also includes To Sir, with Love 2 from 1996. A bonus for fans of the films or of Sidney Poitier. ���� After thirty years teaching in London, Mark Thackeray (Sidney Poitier) is retiring and attends a farewell at his old school where he announces that, rather than leaving teaching, he has accepted a position at a tough school in South Chicago. The school principal there is Horace Weaver (Daniel J Travanti), an old friend of Mark�s but we learn that Mark has another reason for moving to Chicago: to find the woman he fell in love with over forty years ago in Guyana. The Chicago that Mark enters is almost a war zone with graffiti on all the walls, derelict buildings, gangs fighting on the streets, drugs, knives and guns. At the school Mark volunteers to teach the worst class and faces the same kind of challenges he had confronted, and beaten, in East London with a class of delinquents who in a few months will be leaving school. In the class are gang leader Wilsie Carrouthers (Christian Payton), his brother Arch (L. Z. Granderson), hustler Danny (Fernando Lopez), Rebecca (Casey Lluberes) who only wants to be popular, and the artistic Evie (Dana Eskelson). But, Mark, with his usual firmness, compassion, courage, intelligence and, above all, belief in the young people as adults, gains the respect of the class. ���� To Sir, with Love II is a TV movie that was made in 1996 for CBS, thirty years after To Sir, with Love. While Judy Geeson and Lulu have cameos at the start of this film, and �that� song is reprised, the only real constant is Sidney Poitier. To Sir, with Love II has a different director in Peter Bogdanovich and a new writer in Philip Rosenberg, although the film still gives a credit to the author of the original novel E. R. Braithwaite. Perhaps there should have been a credit for the writer / director of the first film James Clavell as the plot of To Sir, with Love II is almost a reworking of To Sir, with Love with Mark confronting social issues and underprivileged kids. It is true that the second film expands the scope of the first; there are far more scenes outside of the classroom especially to do with the gang wars on the streets, there is more violence and guns, knives and drugs that were not present in East London thirty years before; in South Chicago the students have to pass through a metal detector to get into the school. There is also a less homogeneous mix of students in Chicago with white, black, Latino and Italian backgrounds and so the film can, and does, raise issues about identify, respect, sexuality and dealing with violence. But, for all that, Mark displays the same traits, and even repeats some of the same scenarios as in To Sir, with Love with the same results. Where the screenplay of this film deviates, such as the reunion of Mark with his lost love, it becomes very mawkish! ���� Sidney Poitier is again excellent as a teacher of will, understanding and integrity, and Christian Payton, Dana Eskelson and Casey Lluberes are also good, although it is Poitier who holds the film together. Director Peter Bogdanovich had a purple patch in the 1970s with the Oscar nominated The Last Picture Show (1971) followed by What�s Up, Doc? (1973) and Paper Moon (1973) after which his star faded. By the time of To Sir, with Love II he was doing TV work; in To Sir, with Love II his work is professional, but nothing special. ���� Did we need To Sir, with Love II, a reworking of To Sir, with Love and another story of an inspirational teacher who turns around a class of delinquents and makes them reasonable adults with a future? Probably not, but with the marvellous Sidney Poitier in fine form, aged but definitely unbowed, To Sir, with Love II is far better, and far more entertaining, than it had any right to be. ���� To Sir, with Love II is presented in the original 1.33:1 aspect ratio, in 1080p, using the MPEG-4 AVC code. ���� There is nothing special about this print of a TV movie, but nothing wrong either. Interiors and close-ups are strong, colours natural, blacks and shadow detail good, brightness and contrast consistent, skin tones fine. There are no obvious marks or artefacts. ���� No subtitles are provided. ���� Audio is English Dolby TrueHD 5.1. ���� I cannot say that I really noticed anything much in the rears other than a bit of noise during the rowdy class scenes. Other effects, such as gunshots, lacked much by way of depth and the subwoofer was pretty much unused. Dialogue is clear throughout while the original score by Trevor Lawrence is sparsely used. The hit song performed by Lulu gets a short run. ���� Lip synchronisation was fine. ���� Nothing. The silent menu only offers �Play�. ���� There are DVDs of To Sir, with Love II available in the US and UK but as far as Blu-ray is concerned Amazon only lists this Australian Blu-ray of the To Sir, with Love: Complete Collection with includes both To Sir, with Love and To Sir, with Love II. ���� While many people may be familiar with To Sir, with Love, and the hit song, this is not the case with To Sir, with Love II, a TV movie made 30 years after the original. Clearly, this second film does not have much of a profile; I could only find one review of a DVD of the film anywhere. With another excellent performance by Sidney Poitier, To Sir, with Love II is far better than I had expected. Fans of the first film, or of Poitier, should enjoy picking this film up as part of the To Sir, with Love: Complete Collection from ViaVision. ���� The film looks fine on Blu-ray, the audio is good. No extras of any kind.